A "bi pin" or "bipin" bulb is exactly what it sounds like, a bulb with two connector pins for connecting to a lamp holder and fixture. There are different sizes of bi pin connectors, depending on the bulb. T8 (1 inch) and T12 (1.5 inch) bulbs use the exact same size bi pin configuration, which is why they can usually use the exact same lamp holders. Different size bulbs, like the smaller F54T5 (5/8th inch diameter) have to use a smaller lamp holder. 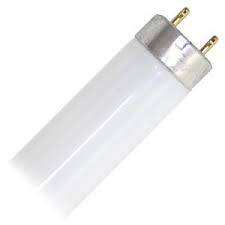 Bi pin is the most common connector you will find on all fluorescent lamps. There are single pin lamps, like in the 8 foot lamps, but they are the exception.